The Greenfield Ave. Bridge will be replaced in 2016. An estimated 19,000 vehicles cross the Greenfield Avenue Bridge each day, but commuters will have to find a new route later this year. That’s because the bridge is being demolished and the replacement won’t be open until 2017. Prep work for the demolition is expected to begin in in mid-October. The City’s Department of Public Works is hosting a public meeting Tuesday in which officials will reveal the new bridge’s official design. According to Hassett, the Parkway East (I-376) will close down most likely on midnight Christmas day for the bridge’s implosion. The contractors, who will be chosen in July, will have five days after the implosion to clean and prepare the road for travel again. He said they plan to work closely with the contractors to minimize the impact of the implosion on the surrounding areas. “They will be doing a structure-by-structure survey of the buildings prior to the implosion so as to have a record of what those structures were like, and if there were any damage to occur because of the implosion, they would be able to confirm that with their bonding company,” Hassett said. He added that the contractor will be fully insured to cover any damages done as a result of the demolition. Hassett said the Department of Public Works held a general public meeting last January in which the department heard feedback from the public – most of which has been mixed. More than 90 years old, the bridge underwent rehabilitation in the ‘80s, and an “under-bridge” became necessary in 2004 to catch falling debris. Some components of the old bridge will be preserved for use on the new one according to Hassett. But he added that this bridge does not meet the current standards, so most of it will be new. “Some of the new features we’re adding include replication of stone walls and the abutments…we’re putting in new historic street lighting, and we’re bringing back what’s called the brush finished look to the parapet (railing) of the bridge,” Hassett said. City of Bridges: The following report is the second is a three-part series examining the status of Pittsburgh bridges as the Pennsylvania Legislature considers funding for transportation infrastructure. 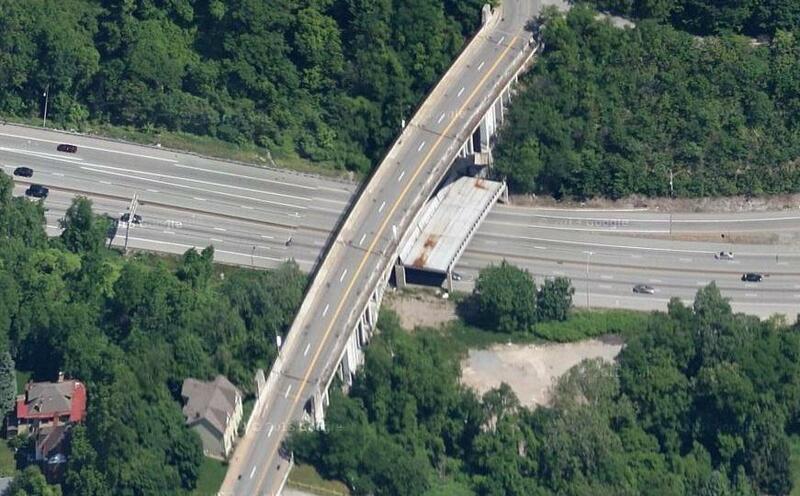 Hundreds of bridges in Allegheny County alone are overdue for repairs or upgrades, and whatever happens in the final weeks of the legislative session, it’s unlikely lawmakers will approve funding for all of them.